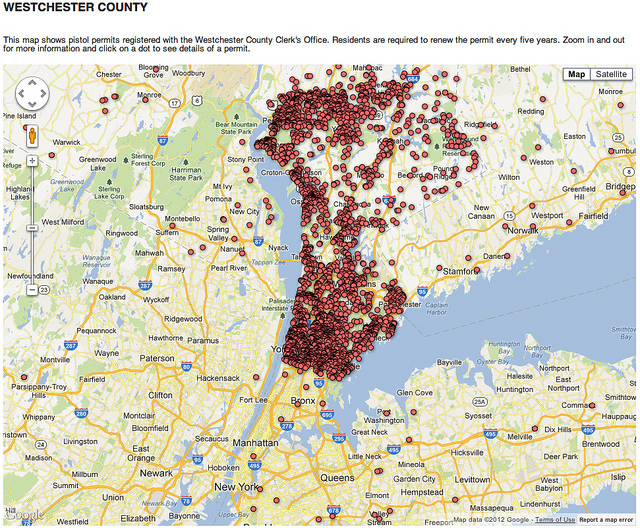 On December 22, 2012 a Westchester County, New York newspaper, The Journal News, published a scalable, interactive map of area pistol owners complete with names and addresses. The information had been acquired from public records under the Freedom of Information Act. Response to the newspaper’s actions was swift. One reader commented, “This is the single most irresponsible and dangerous piece of ‘journalism’ I have ever seen.” Another referenced personal attacks on the staff, saying using guns against liberals would be “like shooting fish in a barrel.” To that end, The New York Times reported that the newspaper had gone so far as to hire armed guards to protect its headquarters and a satellite office. There are a number of ethical concerns here. As Kathleen Bartzen Culver, associate director of the University of Wisconsin-Madison’s Center for Journalism Ethics points out, in publishing the data in the way that it did (with scalable maps, names and addresses of pistol owners), it effectively facilitated gun thefts and crimes against those without a means to defend themselves. Moreover, the published map did not include ownership of shotguns, rifles or assault-type weapons, which do not require permits in Westchester County. In what ways were the decisions made by the newspaper’s staff morally defective? Update (February 26, 2013): Here’s a terrific follow-up piece from PBS’s MediaShift on how newsrooms should use data.